Back of card: Red plaid (pinkish) crosshatch. Book included: Yes, 96 pages, 4.5 x 6.9, or 115 x 177 mm. Illusrated. By Stuart Kaplan. Publisher: U.S. Games. Printed in Switzerland by AGMuller. Comments: The notes packed with the cards identifies this deck as the one featured in the James Bond film, Live & Let Die. These are very modest witches - no sky-clad frolics for them. They are also 1980's witches with big, big shoulder pads. Unlike some witch/pagan decks, these cards do not reveal much about pagan ritual. This is a Marseilles-type deck, not only in the minor arkana cards, but in court cards & major arkana as well. Try as you might there are few if any overt stories on these cards, though some of the symbols may hint at more to those who know how to read them. The US Games catalog says the images are dreamlike fantasies in a surreal style & we agree. 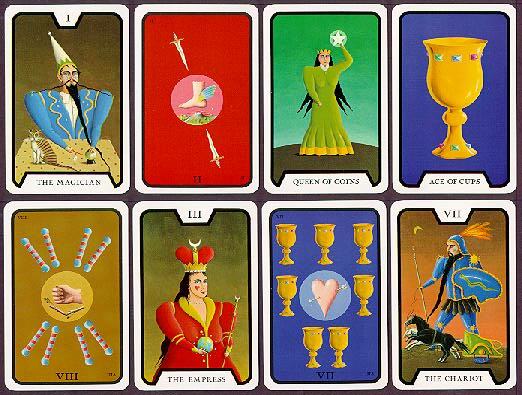 Kaplan includes notes on how covens are structured: Five male/female couples, representing the ten pip (suit) cards, plus the high priestess (queen) & her consort, the knight. The final couple is a king as warlock & the page as a witch in training, though the notes are unclear if the training will result in a high priestess (in which case, her consort, the king, becomes a knight), or as a member of the pips, in which case the king becomes another pip. Or maybe she finds another consort. In either case, guys, this is not the patriarchy with which we're familiar.